KEAM Hall Ticket 2019 :Commissioner of Entrance Examinations (CEE) Kerala has scheduled to conduct the KEAM examination 02nd and 03rd May 2019. All the applicants who have applied for the Kerala Engineering Medical Agriculture Entrance test are hereby informed to download KEAM admit card 2019. The CEE as announced the hall ticket release date as 16th April. Hence the KEAM hall ticket 2019 will be available from 16th April onwards. Candidates can get their admit cards from cee-kerala.org. All the students can hurry up to download the hall tickets as the exam date is nearing. It is the most important document to proceed with the examination. Without hall tickets, candidates will not be allowed to carry forward with the examination. Check more details of KEAM Call letter from the following. Every year, KEAM test will be conducted by the CEE (Commissioner of Entrance Examination) for the eligible candidates for giving admission in to various Under Graduation courses or programs such as MBBS, BHMS, BDS, BAMS, B.Sc (Forestry), BSMS, B.Sc (honors) agriculture, B.FSc, B.VSc (animal Husbandry) and B.Tech (in all branches) in the tops collges or the institutions of the Kerala state based on the merit or the rank they obtained in the exam and with the qualifying standards that are set by the CEE Kerala. Many of the hopefuls seeking to get admission in Kerala colleges clash for the KEAM entrance test. This year the KEAM Paper 1 [Physics & Chemistry] will be held on 02nd May from 10 AM to 12.30 PM and the KEAM Paper 2 [Mathematics] will be conducted on 03rd May from 10 AM to 12.30 pm. 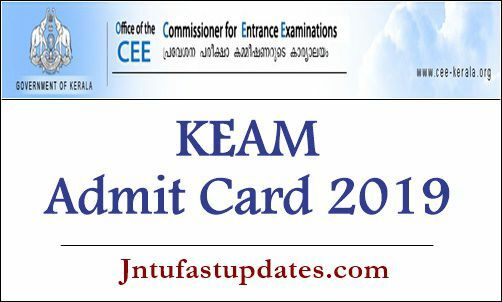 Aspirants applied for the KEAM entrance test during the application dates can download KEAM hall ticket 2019 from the CEE official portal, cee-kerala.org. The hall ticket comprises the information of examination venue, date, timings, candidate’s name, father’s name, date of birth, Roll Number, Gender, Course Applied For, Application Number, Photograph and Signature and other details. After downloading the admit card, check all the details keenly. If any spelling mistakes/printing mistakes appear in any column, candidates can make a complainant to CEE authorities for necessary corrections. Students must carry their admit cards without a miss. And students appearing for the KEAM entrance test are advised to reach the examination centre before 30 minutes of the examination. So that they can avoid the late reaching tension. Carry any of the valid identity proof Xerox copy along with admit card. Students can check the important guidelines from the hall tickets. Go through the instructions and proceed accordingly. Visit the CEE official website to have more information regarding the CEE KEAM examination 2019. The admit card will be accessible @ cee-kerala.org,www.cee.kerala.gov.in. On the homepage of the website, students can find ‘KEAM Hall ticket 2019’ link flashing. Click on the link and enter the necessary details over there. The KEAM Admit card gets downloaded on to the screen. Check the details of examination centre and others.